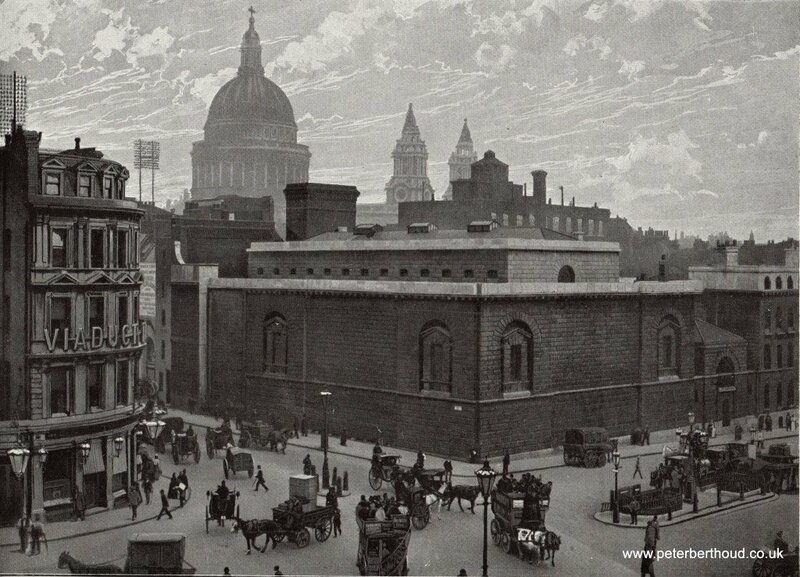 The London that endured the Great Plague of 1665 was largely swept away, the following year, by the Great Fire of London. Although blamed, at the time, on foreign or Catholic agents provocateurs, the fire was, in fact, an accident; the inevitable consequence of the growth of a city of timber-framed buildings with thatched roofs. 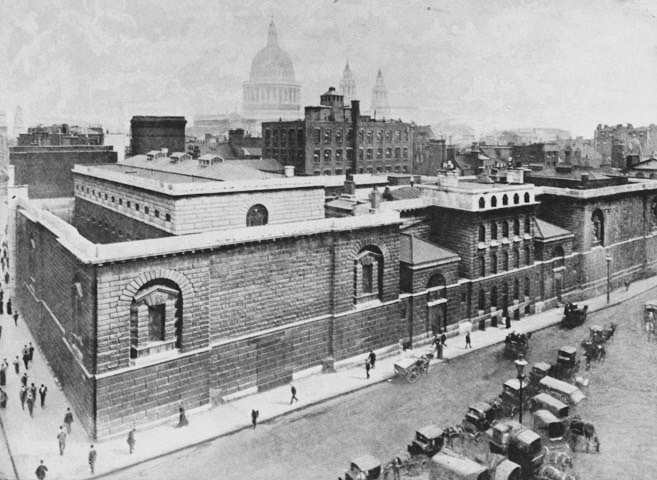 The new city that sprung up in its place was built, largely, of brick, stone, and tile, and had, as its centre-piece, Sir Christopher Wren's bold new design for Saint Paul's Cathedral, as controversial a piece of architecture in its time as anything built by Norman Foster, Richard Rogers, or Renzo Piano in our own times. London in 1751, by Thomas Bowles (image is in the Public Domain). 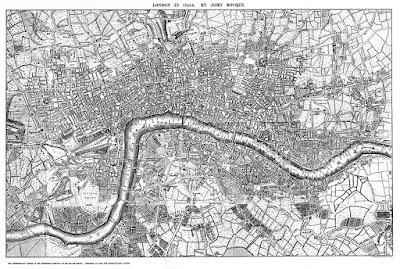 London was still growing, its population swelling from an estimated 200 thousand in 1600; to 600 thousand in 1700; and 959 thousand by 1801; an increase fueled mainly by migration from the British countryside. Members of the aristocracy were, increasingly, spending part of the year "in town," attracted by a "social season" that included performances of Shakespearean plays and Italian opera; and the life of the coffee-house, which combined business with pleasure. Many poorer people were attracted to the city by the new opportunities in domestic service and the retail trade, but social mobility operated in both directions, downwards, as well as upwards: a servant, apprentice, or shop-worker who lost his or her position (including women who became pregnant, who were almost invariably dismissed) had few options open to them apart from prostitution or crime. 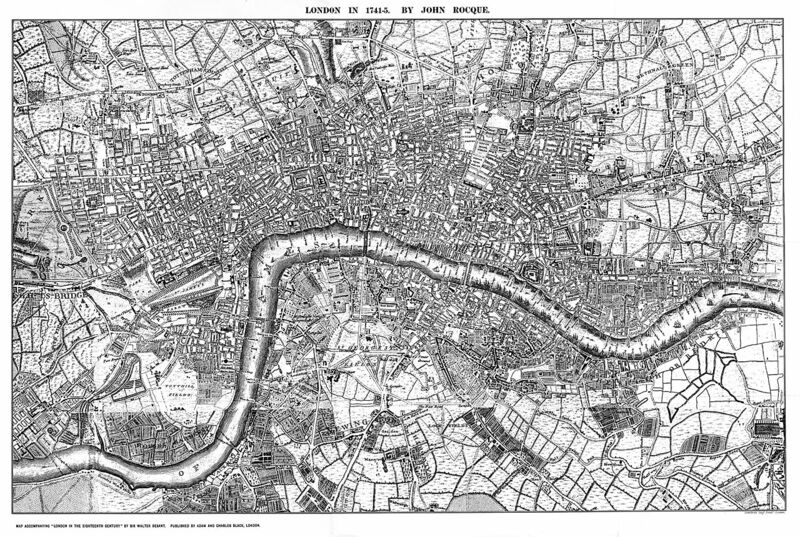 John Roque's map of London, 1741-45 (image is in the Public Domain). 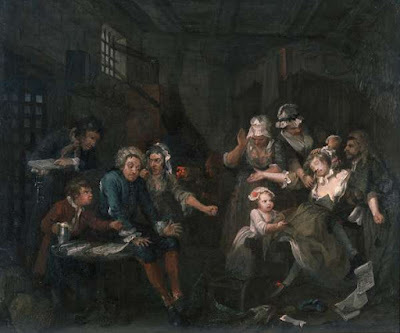 "The Rake at the Rose Tavern," by William Hogarth, Sir John Soane's Museum. The anti-hero of the series (The Rake's Progress), Tom Rakewell, is here being relieved of his watch by a prostitute. 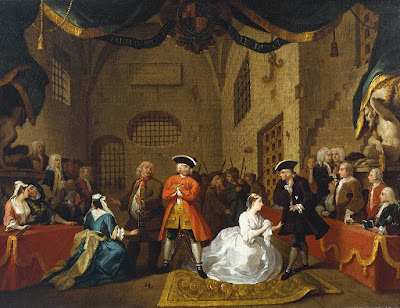 "The Rake in Prison," by William Hogarth, Sir John Soane's Museum. 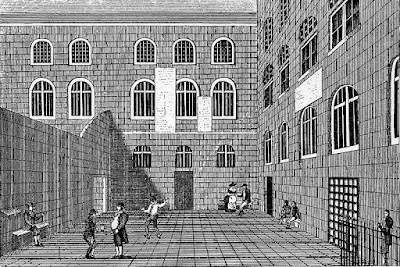 In a city without a Police force, the fear of crime was real, and ever-present, and the authorities responded with harsher and harsher penalties. 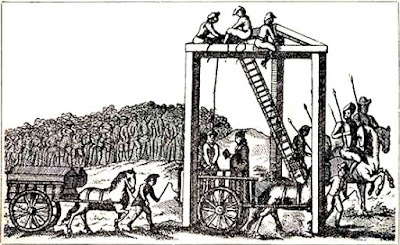 In 1688, there were fifty offences listed as being punishable by death; by 1776, there were almost two hundred; by 1799, two hundred and twenty. 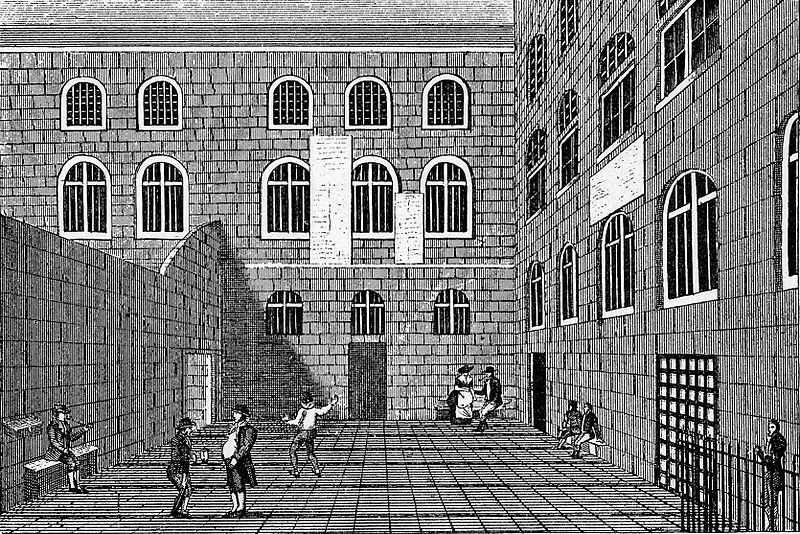 Prostitutes and pickpockets feared both the cells of Newgate Prison, and the "triple-tree" of the Tyburn gallows, where Marble Arch stands today. 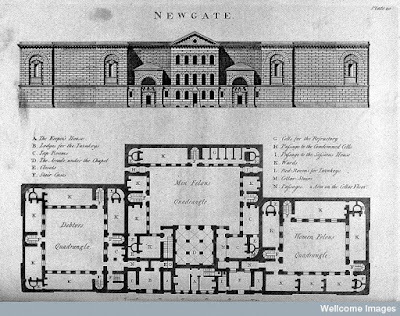 Newgate Prison, 1780 plan by the architect, Charles Dance. 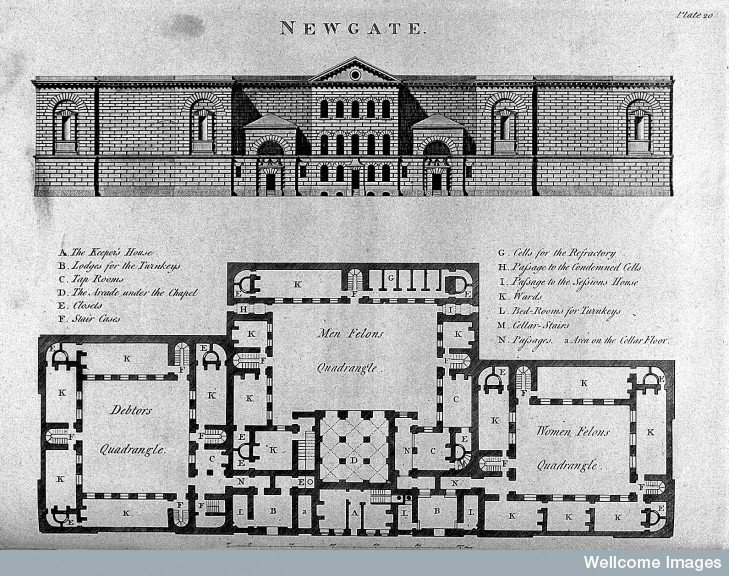 The Inner Court of Newgate Prison in the 18th Century (image is in the Pubic Domain). Newgate Prison in 1902, prior to its demolition (image is in the Public Domain). Tyburn in 1680, National Archives WORK 16/376 (image is in the Public Domain). 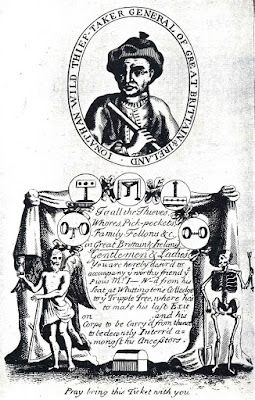 The City authorities employed "Under-Marshals" to keep law and order, and to apprehend & prosecute criminals, but, heavily dependent on testimonies from within the criminal community, the opportunities for, and temptations of, corruption were manifest and manifold. The most notorious example was the self-styled "Thief-Taker General," Jonathan Wild, who was himself hanged at Tyburn in May, 1725. 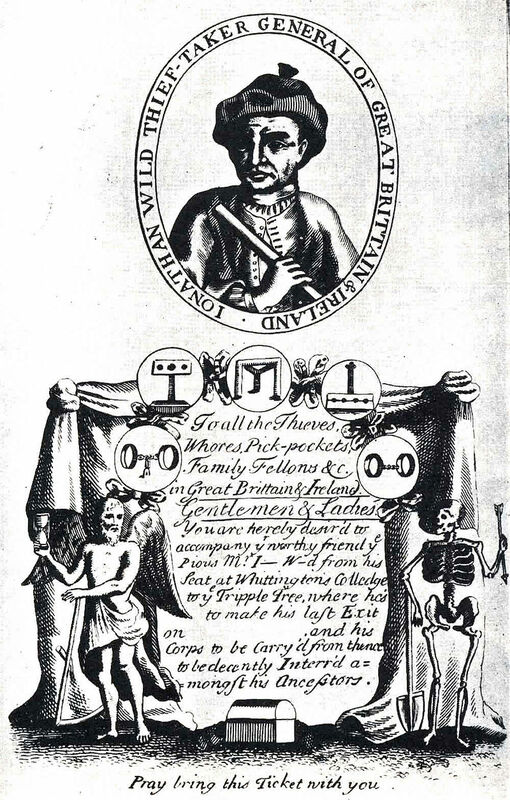 Ticket for the public execution of Jonathan Wild (image is in the Public Domain). Prison scene from John Gay's The Beggar's Opera (1728), which satirises both the legal and political situations of the day, by William Hogarth (1728), Tate Britain (image is in the Public Domain). 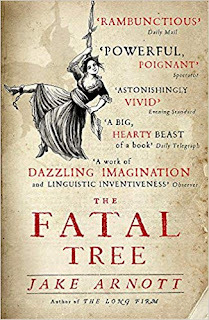 Jake Arnotts novel, The Fatal Tree, follows the criminal careers of Elizabeth Lyon ("Edgworth Bess"), and her lover, the burglar, Jack Sheppard. These were real people (Sheppard was hanged in 1724; Lyon was transported to Maryland), and Arnott has made extensive use of the records of trials at the Old Bailey: his Bess narrates her own story, using the "Canting" patois known to have been used by prostitutes and criminals in Eighteenth Century London), which is interspersed with the commentary of William Archer, a fictional journalist (addressed to his editor) with personal and criminal secrets of his own. 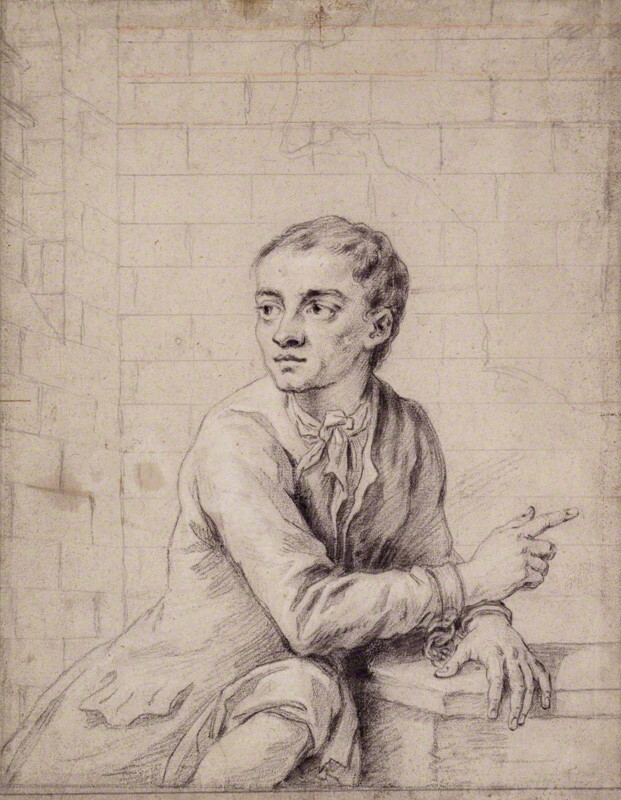 Jack Sheppard, by James Thornhill, 1724 (image is in the Public Domain). "I was born in the small town of Edgworth, some ten miles north of London, the year Queen Anne came to the throne.If any seek significance as to why the place of my birth was later to provide my notorious alias, they might note that the old Roman road from thee makes one straight line to London, without a single turn or bend in it, and ends directly where Tyburn now stands. So this as my swift journey from innocence and, in truth, I was headed for the gallows of that wicked city too soon and far too young ... ". "Arriving in London I felt a fierce assault on all my senses: the bewildering parade of people and carriages in the streets, the mad bustle of business, the shriek and clatter of its traffic. And the stench! Scattered heaps of filth, dead fish and offal, dung everywhere. Ragged beggars clamoured at every corner. I held my little bundle close and made to walk in a manner that might show I knew my way. But I was hopelessly lost." "It was dark as we left the coffee-house, and the lamps of the link-boys glowed here and there, marking out a constellation across the cobbled piazza. One of the theatres had just emptied its crowd, an now a boisterous audience set forth to make its own drama. We passed the column with its sundials and gilded sphere. On its steps women sat selling hot milk and barley broth. I was led up a side-street to a quiet and respectable-looking terrace. 'Welcome to our house of civil reception,' said Punk Alice, as she ushered me up some steps to the front door. As we entered, a surly footman roused himself from a chair in the hallway. 'Fetch Mother,' Alice snapped at him, and he skulked off to some back-parlour." "Dear Applebee, Thank you for the ten guineas received on account and your comments on the text. 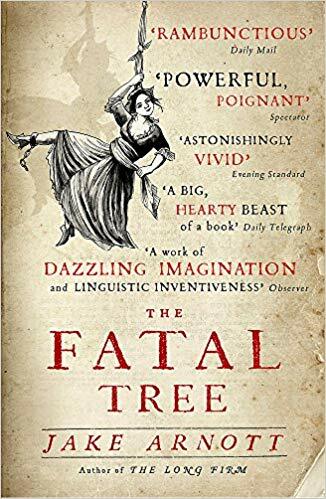 You rightly protest that many will complain of the possible corrupting influence of this story, that Bess rather flaunts her bodily crimes and pleads little for the mercy of her soul. But you know as well as any that this might be her final whoring and could well be a draw to the public. From a shadow-world a shadow-gospel is rendered: the flesh made word where only the intoxication of sin can be offered as mitigation. And though I'm sure that the idle reader may appreciate this, it is to be hoped that when her case comes up before the next sessions she can deliver a better defence than that. But, then, you know the old jest about a jade who plied her trade by the Temple: that if she had as much law in her head as she had in her tail, she would be one of the ablest counsels in England." Mark Patton is a published author of historical fiction and non-fiction, whose books can be purchased from Amazon.